This page links to documents related to the plant species Scaevola ramosissima commonly known as Purple Fan-flower or Snake Flower. 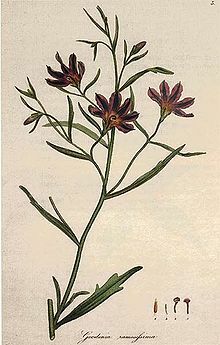 Goodenia ramosissima (now Scaevola ramosissima), as figured in A specimen of the botany of New Holland (1793), in which the species was first described. Goodenia ramosissima (now Scaevola ramosissima) described on page 349. Scaevola hispida (now a synonym of Scaevola ramosissima) described on page 99. Scaevola hispida (now a synonym of Scaevola ramosissima) figured in plate 510. Scaevola hispida (now a synonym of Scaevola ramosissima) transferred into Merkusia as Merkusia hispida on page 162. Scaevola hispida and Scaevola apterantha (both now synonyms of Scaevola ramosissima) transferred into Lobelia as Lobelia hispida and Lobelia apterantha respectively, on page 378. Goodenia ramosissima transferred into Scaevola as Scaevola ramosissima on page 141. Scaevola apterantha (now a synonym of Scaevola ramosissima) demoted to a variety of S. ramosissima on page 142. This page was last edited on 31 January 2011, at 16:58.